Our son is putting on his usual airs of the story being “too creepy,” but he’s really synced in with the adventure. There’s a bit in part three where Tegan, keeping watch in the corridor, spots the seven mutants gliding her way and she jumps back to warn everyone. Our kid jumped right in time with her, leaving his shoes behind. The problem with “Mawdryn Undead” is that it could have been the best two-part story the show ever made in its original run, and the best by a mile. It might have made an excellent three-parter. Unfortunately, it’s lumbered with that godawful opener, and I’m afraid part four will kind of run in place a bit to fill its running time. But these middle episodes are just cracking with imagination and originality. Once the story finally decides to place the Brigadier in the center of things – two Brigadiers, in 1977 and in 1983! – Nicholas Courtney gets to really shine. And who can’t sympathize with our old friend when he grumbles about “yomping up that wretched hill” three times in one afternoon? I really think that all of Steven Moffat’s “timey-wimey” stories from his run have their genesis here. When Moffat was a fanboy, he wore out his off-air videotape of this adventure from rewatching it over and over. Of course, another thing our son’s pretending to be aggravated with is the return of Valentine Dyall as the Black Guardian, after his brief but memorable appearance in part six of “The Armageddon Factor” a little over three years previously. About the only thing I don’t like about these episodes is the casual way the Doctor has decided to just take Turlough’s knowledge of alien science at face value without challenging him on it. Clearly he knows something is up with this kid – and since, despite casting an obvious twentysomething in the role, Turlough can’t be much older than seventeen to still be at this posh private school – even though he doesn’t know that the Black Guardian is the one manipulating him. Dyall is amazing, a real force of nature. After he gets done yelling at Turlough in the school clinic, I want to go give the poor fellow a hug and order him some milk and cookies to calm his nerves. And I don’t even like Turlough. I’ve always thought that the Doctor had at least an inkling from pretty early on that the Black Guardian was using Turlough. The Doctor clearly perceives that someone is manipulating events from behind the scenes. 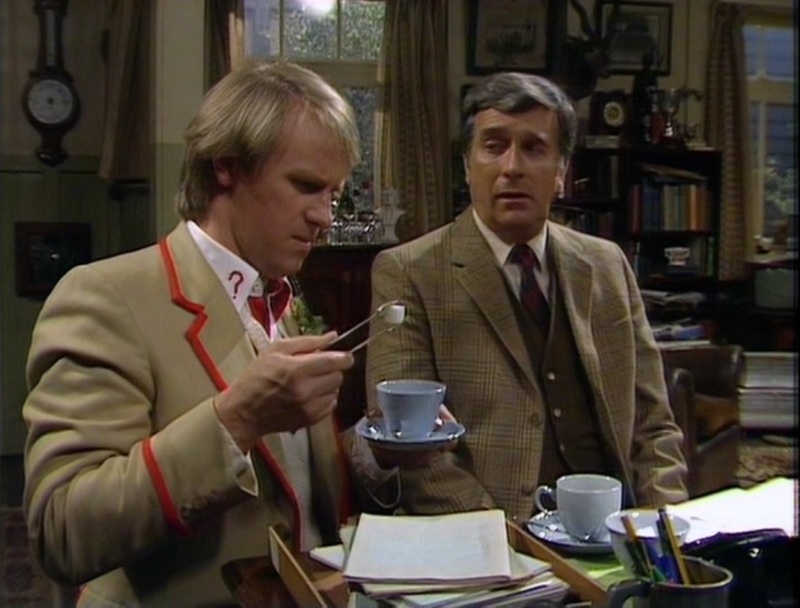 Then he discovers the crystal provided by the Black Guardian among Turlough’s belongings. It’s been suggested by some viewers that the crystal was created from the same substance as the Key to Time, which would be a major red flag to the Doctor that the Guardians were involved.